Last Christmas, one thing kept appearing on the top of Roo's lists for Santa: Puppy in My Pocket. I knew she was obsessed with dogs but when she kept scrawling it all over, I assumed it was something she'd made up. Umm, no. Puppy in My Pocket is a line of teeny-tiny flocked puppies (and kitties and ponies and jungle animals, and now babies!!! scroll down for a picture…) that are ultra-collectible in the preschool/kindergarten/early elementary school girl world. You can even wear them as charms these days. Who knew? 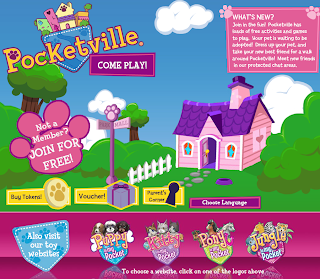 Now Roo's discovered Pocketville, an online world where kids can play games, decorate their own environment, and adopt virtual "In My Pocket" pets. She loves creating and making over her own avatar and playing the free games to earn Paw Points to buy food and toys for her puppy, BoneCupcake.